As part of my spiritual reflections for Advent this year, I am looking at an appropriate hymn for Advent each morning. Today [14 December 2014] is the Third Sunday of Advent, and the readings in the Revised Common Lectionary for this morning are: Isaiah 61: 1-4, 8-11; Psalm 126 or Magnificat; I Thessalonians 5: 16-24; John 6 1: 1-8, 19-28. That Gospel reading is part of the Prologue to Saint John’s Gospel. Later this morning, I am presiding at the Cathedral Eucharist at 11 a.m. in Christ Church, Cathedral, Dublin. So, this morning, on the Third Sunday of Advent, ‘Gaudete Sunday,’ I have chosen the carol Gaudete! gaudete! Christus est natus, which reached No 14 in the charts in England with Steeleye Span in the early 1970s. During Advent some years ago, I wrote of this song, which was popular in the early 1970s, and how I first heard it around the same time as I was introduced to English folk rock while I was in the English Midlands and writing for the Lichfield Mercury. On Gaudete Sunday, I think the story of the song is worth telling once more. Steeleye Span was formed in 1969, and they often performed as the opening act for Jethro Tull. A year after recording Below the Salt, it came as a surprise to many when they had a Christmas hit single with Gaudete, when it made No 14 in the British charts in 1973. This a capella motet, sung entirely in Latin, is neither representative of Steeleye Span’s repertoire nor of the album. Yet this was their first big breakthrough and it brought them onto Top of the Pops for the first time. It is one of only three top 50 British hits to be sung in Latin. The others are two recordings of Pie Jesu from Andrew Lloyd Webber’s Requiem by Sarah Brightman and Paul Miles-Kingston in 1986, and by the then 12-year-old Charlotte Church in 1998. Gaudete may have been composed in the 16th century, but may date from the late mediaeval period. The song was published in Piae Cantiones, a collection of Finnish and Swedish sacred songs published in 1582. The Latin text is a typical mediaeval song of praise, following the standard pattern for the time – a uniform series of four-line stanzas, each preceded by a two-line refrain (in the early English carol this was known as the burden). The reference in verse 3, which puzzled many fans at the time, is to the eastern gate of the city in Ezekiel’s vision (Ezekiel 44: 2). The gate is a traditional symbol of the Virgin Mary. Since the mid-1970s, despite the change in their line-up and the loss of names like Maddy Prior and Gay and Terry Woods at different times, Steeleye Span often include Gaudete as a concert encore, and it was published in 1992 in the New Oxford Book of Carols. I missed their live concert in Vicar Street, Dublin, last May. They are touring Britain next February and March. 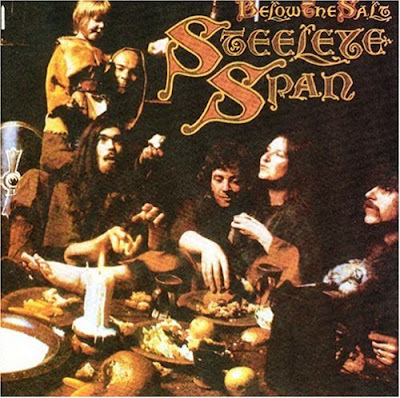 The original is here: Gaudete by Steeleye Span. A more recent recording is available here from the ‘World Tour’ 35th Anniversary DVD. There are other arrangements by Michel McGlynn, recorded by Anuna, and an arrangement by Bob Chilcott which is part of the Advent and Christmas repertoire of the Choir of Christ Church Cathedral, Dublin. Let us rejoice in good memories, let us rejoice that Christmas is coming, and in the midst of the present gloom let us rejoice that the coming of Christ holds out the promise of hope, the promise of his Kingdom, the promise that even in darkness the light of Christ shines on us all.